Good news, my new webcomic Shamus Stone has begun updating! The site will update two times a week until the story reaches its conclusion. It’s a film noir-ish detective/who-done-it story done primarily in black & white (No offense!). Can you solve the case, before our stoney sleuth does? Originally I had hoped to launch the Shamus Stone webcomic site on November 1, but things have been extremely hectic and I have had some problems getting back into the ol’ webcomic production workflow. So I’m hoping to launch the Shamus Stone Comic on November the 18th. Watch this space for the link! Indavo art of the final print volumes! Volume 5 has been ready for some time, but I’ve not yet had it printed. I’m currently compiling Volumes 6 & 7, once they are proofed and ready I will print all three at the same time. Below are the covers for 6 & 7. Be sure to drop in on my deviantART page for enbiggenable images! Today is Indavo Seventh Anniversary! Wow! And to celebrate is a new illustration. You may notice a few changes in coloring style, character design, etc. These reflect what may come to pass if Indavo, Racheal & the rest of the cast one day return to Webcomicdom. You may remember, just two months ago, I said I had no plans or story ideas for that return . . . well, a few possible storylines have been popping up into my head, almost subconsciously. 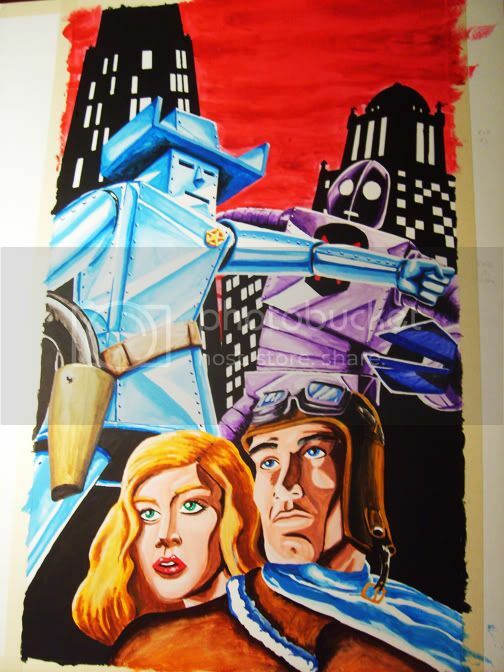 But these would still be after my upcoming Shamus Stone Noir Webcomic. Thanks for reading! 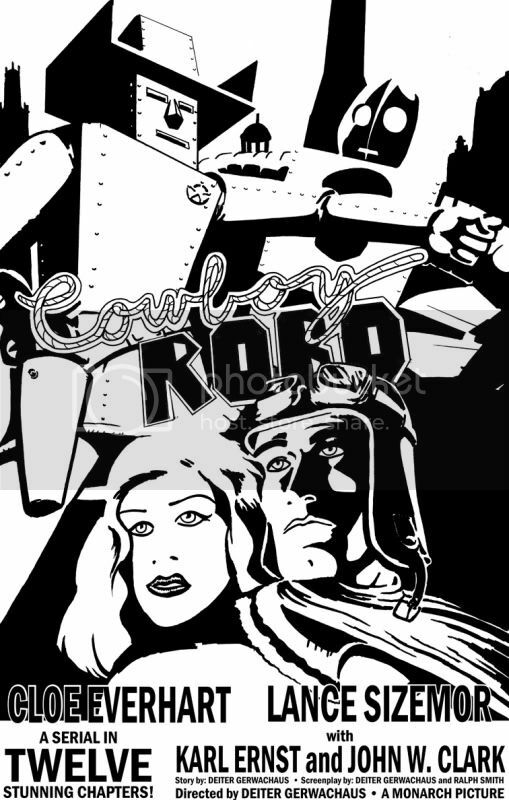 I’ve just finished painting a version of this Cowboy Robo Poster . I painted the new one with Gouache on a huge Illustration Board. I will add in the CR Logo as well the other text later. This took forever for me to paint this. That’s probably why I haven’t painted anything in many years. Below is a quick snap of the finished version!